The Media Library tab is where you can upload new images or videos, as well as manage those which have already been uploaded. You are also able to remove images and videos within the Media Library tab. Enter the product number, product name or keyword in the search box at the top left of your screen and click the magnifying button. You can search for multiple images by separating them using a comma and a space. After searching, you will be able to use the filters to narrow your results further using the available options. Filter your products by the criteria listed in the left hand column of the page: Status, VS (Virtual Sample) Status, Colors, and more. The number in parenthesis is the amount of images which are categorized within the option. Click on the See All link to view all values within each criterion. Size (pixels): Recommended 2400x2400; Minimum is 600x600. Resolution: Minimum: 300 DPI/Maximum: 600 DPI (better quality images help drive customers to your products). Image aspect ratio (relationship of height to width) must be maintained when re-sizing images. Unauthorized trademarks and/or logos without proper authorization. File Size: Maximum 10 MB (any file over 5MB should be compressed). Please put multiple image files in a Zip folder. Make sure the file name for your main image matches the product number, for example, DS154.jpg. Name additional images by product number and color/shape, for example DS154-red.jpg. Upload both decorated and blank versions of the images. 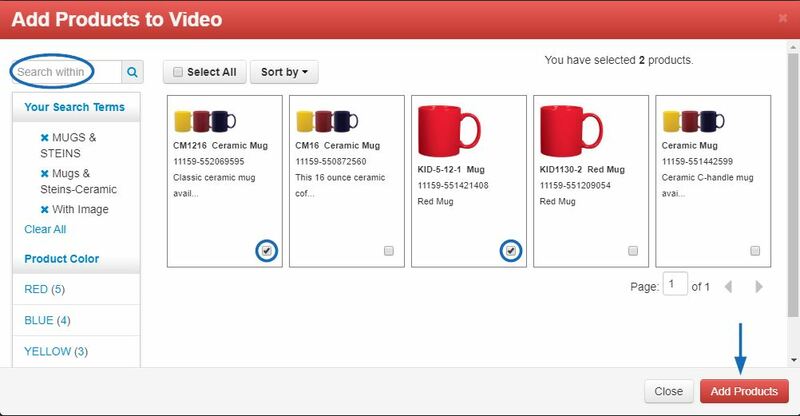 This allows distributors to see examples of the item imprinted and/or create a virtual sample for their client. 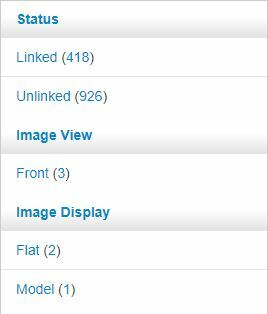 When using multiple images, tag the images with attributes like color and shape to ensure the appropriate image displays in search results and increase the likelihood that a distributor views it. To add images in the Media Library tab, click on the Upload Images button. In the Upload Multiple Images window, click on the Select Files button. Browse your computer, select the image(s) you would like to upload, and then click on Open. Then, click on the Upload button and after the image displays with the Success banner, click on the Continue button to return to the Media Library. To add Media Tags to images, click on the checkbox in the lower right corner of the image(s). Then, click on the Add Tags button. Select the tags to add to the image(s) and then click on Save. To remove an image from the Media Library, click on the checkbox in the lower right corner of the image(s). Then, click on the Delete Images button. To upload a new video, click on the Add Video button. Please note, a list of previously uploaded videos will be displayed. Enter information in the required fields and then click on the "Save" button. Note: All required fields must be completed before the "Save" button will be enabled. The Video Name, Type and URL fields are required. However the description field is optional. If you are using Microsoft 10 with the Edge browser, you may not be able to upload a video. Please use a different browser, such as Google Chrome or Mozilla Firefox. Select Product as the Video type. 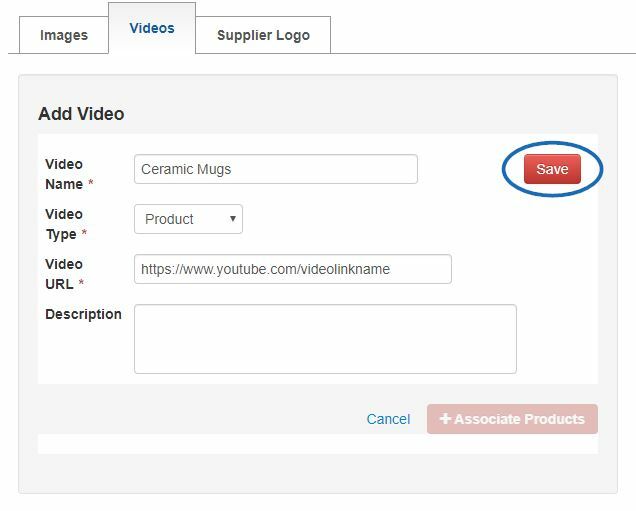 (The ability to add a Supplier video is a future functionality). Accepted video URL types are YouTube, Vimeo, or Facebook. Every Product Video must have a unique URL. Note: If you are providing a video via Vimeo and have a Vimeo plus account, we recommend that the end screen of your video be customized so it does not display suggested videos from Vimeo staff or other Vimeo subscribers. Please refer to the Vimeo Help Center for more information on their end screen offerings. 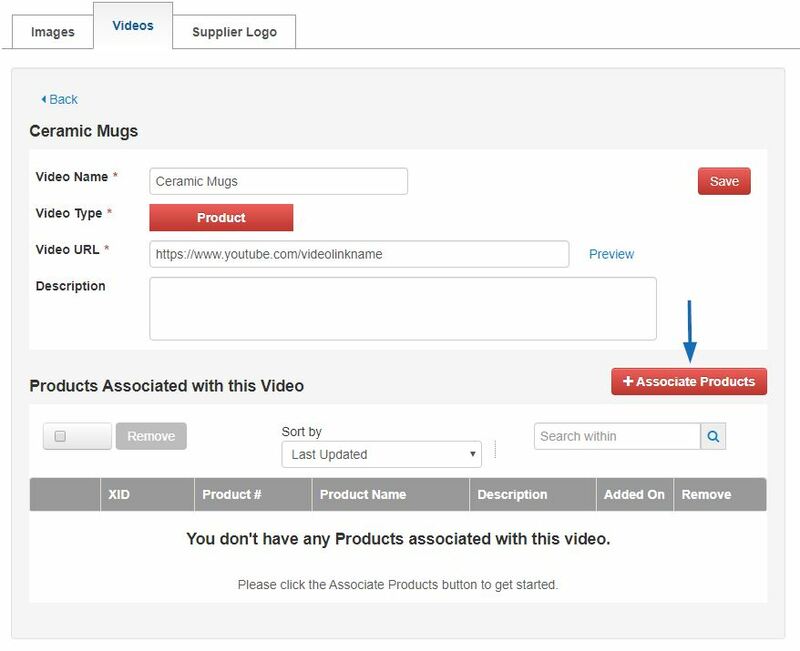 Once you have uploaded and saved the video, you will have the ability to add products. Scroll to the bottom and click on the "+ Associate Products" button. A listing of all of your active products will display. From here, you can select all of your products by checking the "Select All" box or you can use the sort and filter features to locate and select specific items. Check the box under the image of each product you want to add then click on the "Add Products" button. If any of the products you've selected are already associated with another video you will receive a message listing the products that were not able to be added to this video. Click OK. You will have to delete the products from one video before you can add them to another video. Note:Deleting a product from a video will not remove the product from the ESP Database. A list displaying all products associated with the video will then display at the bottom of the page. You can also add products to an existing Video by going to the Media Library from the main Updates screen. Click the Videos tab. Find the Video you want to add products to and click Edit. Then, follow the same steps as adding items to a new video, as stated above. There are several ways to delete products from videos while you are in the Media Library. Find the video from which you want to delete products and click Edit. You can select products to remove by clicking on the checkbox for the product listing or select all products using the checkbox at the top and then clicking the Remove button. You can also remove individual products by clicking on the trash can icon to the far right. If you have many products associated with the video, you can easily find the products you need to remove by using the "Sort" filters or Search field. You can also remove the product from the video while you are on the Media Page of an individual product. To do this, go to the Manage Product Tab and locate the product. Then, click on the Edit button. Click on the Media section. Scroll to the bottom of the page. The video associated with the product will display in the "Manage Video" section. Click the blue "X" and this product is no longer associated with the video. Access the Media Library from either the main ESP Updates screen or from the individual Product. Click on the "Videos" tab. A list of existing videos will display. On the right side of the screen click the Delete button. Products will be un-associated from the video (but will remain in the database). If you have many videos you can enter the Video Name in the search field to find the video you wish to delete.